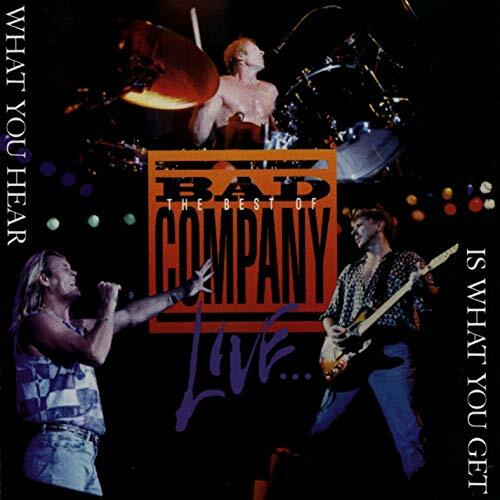 What You Hear Is What You Get (subtitled The Best of Bad Company) is a live album by hard rock band Bad Company, with Brian Howe in place of Paul Rodgers as lead vocalist. Released in 1993, the album covers the 1992 U.S tour, with much of the recording done at various California dates. The band’s introduction was done by Ralphs’ guitar technician (at that time), Gary Gilmore. This version of Bad Company featured Brian Howe on lead vocals, who may not sound like Paul Rodgers but is an awesome singer as well. He deserves all the respect and credit for giving air to a band on it’s last breath after Mr. Rodgers departure. The lineup features Mick Ralphs & Dave “Bucket” Colwell on guitars, Simon Kirke on drums and Rick Wills (Peter Frampton/Foreigner) on bass. Great performances of both classic and new material: “How About That”, “Rock N’ Roll Fantasy”, “If You Needed Somebody” great ballad, “Take This Town”, “Can’t Get Enough”, and of course “Bad Company” which Howe nails making it his own. Take a chance on this live recording where you get the chance to get the whole picture and musical history of a great band.